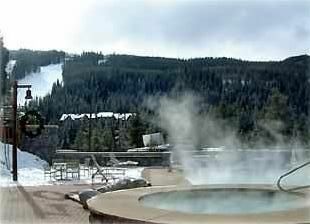 This luxurious, mountain,GOLD PREMIERE, two-bedroom, two-bath condominium is a wonderful place to ski, bike, hike, fish, golf, horseback ride, swim, shop, and, most importantly, relax! Step out from the condominium onto a large private patio area adjacent to the heated pool and two in ground hot tubs(only 4 steps away) and have a beautiful view of the ski run. A wonderful condominium that is decorated warmly and for your comfort with a beautiful gas fireplace in the living area. Very clean and fresh! Located in the River Run Village where there are many shops and restaurants and fun activities! The condominium is a short walk to the gondola. Gas Fireplace in Living Area, Master suite with King-Size Bed and Master Bath, Second Bedroom with Queen-Size Bed, Queen-Size Pull-Out Sleeper in the Living Room, Fully-Equipped Kitchen with Dishwasher, Linens, Ironing Board and Iron, Towels, Basic Paper Products, Hair Dryer, and Much More to make your stay comfortable, Three TVs with Three VCRs, and a DVD Player - even a Sony PlayStation, Lots of Movies and Games, too! Heated, Underground Parking, Laundry Facilities are on the second floor Please no smoking and No pets are allowed ...Thank you. We absolutely loved your condo! Everything was great. The condo was in excellent condition and the location was great! We have stayed in most of the buildings in River Run and yours was our favorite! We hope to book through you again! Thank you! This was a very nice, well furnished place to stay. Everything you would need (aside from personal items) has been furnished. The 1st floor condo is easy to come and go to the ski lift and the village (River Run). It also has pool and hot tub access directly from the outside patio. We even saw a few young moose in the morning who had wandered into the pool area! We enjoyed our stay and had no problems. Dakota Run is quiet and convenient to all that Keystone has to offer. Excellent hosts and living space!! Our family loves staying at this condo. It is close to everything and is a short walk to the gondola. Tom is very responsive to any issues and the condo is very well cared for. Thank you Tom!! Thanks so much Colleen for the kind comments. I appreciate you and your family for staying in my condo in River Run! Hope to have you back again next year! We stayed in this condo for a ski trip in February with our family of 5. We loved the location! You can go right out of the patio door with your ski boots on and skis in hand and walk to the gondola. It's not an easy walk with ski boots but you really can't get much closer. It's about the same distance of a walk as if you stayed outside the village and walked from the shuttle. When we came back to the condo during the day we left our skis in the racks by the gondola and didn't have any problems. They do have a ski check service by the gondola too but we didn't use that. You are so close to the village shops and restaurants but it's still quiet around the condo. The hot tub and pool are literally steps outside the condo. I was concerned that people in the hot tub or pool would be loud but we really didn't have that problem too much. It wasn't very busy when we were there (late Feb). The staff closes the pool at 10 pm so even if it was busy out there it won't bother you late into the night. The kitchen had most everything we needed (no pizza pan or pizza cutter). Kitchen was clean. My son found that the pull out sofa was not real comfortable so he used the air mattress he found in the bedroom closet and slept better on that. We also made use of the 2 humidifiers provided as the air is very dry. We had a few questions for the owner as the week went on and he was always quick to respond via text message to help with whatever we needed. We enjoyed Keystone very much and if we come back we would try to stay here again. The condo is super convenient to everything at Keystone - a short walk to the River Run Village and gondola. Tom has stocked the condo with everything you need, from pots and pans to humidifiers. The underground parking is very convenient. We also very much enjoyed the 5 step walk to the hot tubs! Highly recommend this place! The property is very nice. The kitchen was well equipped for cooking including spices and tin foil, the kind of things you forget to bring with you. The room is right on the main level and next to the pool and hot tubs. Great when you are getting to the hot tub, a bit loud when there are a lot of kids in the area. There are a lot of kids that stay at this location, so if you have a young family this is just for you. If you walk out of the pool area you are right in the little village and are next to the grocery store. It's about a 2 block walk to the lifts, very doable. The chairs for the dining room need some work. The screws are falling out which makes them unstable. I would have fixed it but no screwdriver on hand. The couch is not comfortable and the pull out needs to be cleaned. My son just slept on the couch and he said it was fine. There are several games to play in the unit which is nice for family time off the slopes. I would stay here again.